This spectacular park is located at the base of Douglas Blvd. in West Coulee Dam. It was built in 1936 as a Civilian Conservation Corps project & offers a great view of Grand Coulee Dam. The entrance to this park is deceptively small, but if you venture in and downwards, you will discover a beautiful multi-tiered park. There are bathrooms located at this park open from Dawn until Dusk. 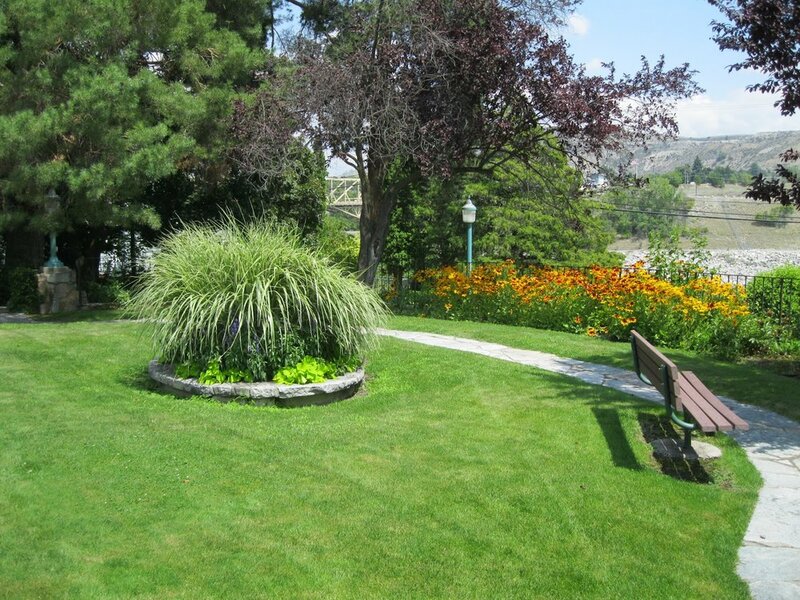 Cole Park is named for the first Mayor of Coulee Dam and was the center of recreation for federal employees. It still offers tennis & handball courts, basketball hoops, volleyball, horseshoes, & picnic grounds. It is located in West Coulee Dam on Columbia Ave. If you take the road behind the Coulee Dam Credit Union you will find a place to park and enjoy this truly unique park. Mason City Memorial Park is located in East Coulee Dam adjacent from the Coulee Dam Post Office. Here you can find a playground for children, picnic tables, and restrooms with a seasonal information center. Plenty of parking nearby, even for large RV's. If you follow the parks natural expansion to the west, you will find Freedom Park, a great location for the laser light show at night. Built in 1937 by the Civilian Conservation Corps, the Candy Point Trail was built to afford a great view of the construction of the Grand Coulee Dam. Its a challenging hike-over a mile round trip with a 700 foot elevation gain. The elevation is the difficult part. The view is rewarding. There are two trail heads, one behind Coulee Dam Town Hall and the other to the north near the north end of North Columbia Avenue. Seasonally, there are some hazards, heat during late spring and through summer and rattle snakes during warm and hot days. Take your time on the hike, enjoy the views, bring enough water and a snack or two. Don't forget your camera! If you are up for a nice long walk along the Columbia River, try the Down River Trail. The Bureau of Reclamation maintains this public pathway. The Starting point is on the east side of the Grand Coulee Bridge in the Town of Coulee Dam. At the east end of the bridge take the walkway that initially leads you towards the dam. The walkway then makes a nearly 180 degree turn going under the Grand Coulee Bridge. Stay on the generously wide path down towards the river. Your walk, run or bike ride follows the Columbia River for 6 miles. Depending on the season, you could see birds like the Bald Eagle and other wild life or you may see some fishermen in boats and on the riverbank. You will be losing elevation going down river. The path ends in a big loop coming back to the primary path for your return.